Forming part of The Faction’s current repertory season at the New Diorama, and a further step on their journey to stage all of Schiller’s works, this production of his first play, The Robbers, strives for modernity, and goes some way to achieving it. Mark Leipacher’s staging is polished and highly physical, but perhaps problematic for a modern audience somewhat less accustomed to buying into morally illustrative caricature. Karl (Tom Radford) and Franz Von Moor (Andrew Chevalier) vie for their father’s love in a competition with no clear lines or rules of engagement. Widely regarded as handsome and loyal, the elder Karl has been away in the army for some years, leaving behind his devoted lover Amalia (Kate Sawyer) and his aging father (Alexander Guiney). Still at home, the younger Franz suffers from a wealth of jealously and ambition, and is also partially crippled by what looks as though it could have been nerve damage at birth. The Robbers asks many questions about masculinity, family, relationships and the power of the church and the state, some of which remain powerfully relevant, others have become more distant in the intervening years since the play caused a stir on its initial reception in 1782. Franz is a compelling and wryly funny character but something of an unreliable narrator as his intention to steal his brother’s inheritance becomes clear; if he cannot have his father’s love, he will at least have his way. Though his machinations increasingly reveal a profound loneliness and paranoia, he remains very much evil for evil’s sake. Chevalier’s physicality is engaging; with every twitch and shuffle revealing Franz’s deep seated insecurities. Frequently he exhorts himself to ‘be a man’ – though it is never clear whether he feels that should entail being physically fit and strong like his brother, or simply a more persuasive, commanding version of himself. While Karl is held up by his father as the paragon of masculinity, it is never clearly delineated what this should be; and although the gender switching of the original Hermann and Daniel to female characters ascribes some of the more ‘masculine’ traits to them, they are (alongside Amalia) at turns strong but ultimately overruled by the power imbalance of their relationships with men. 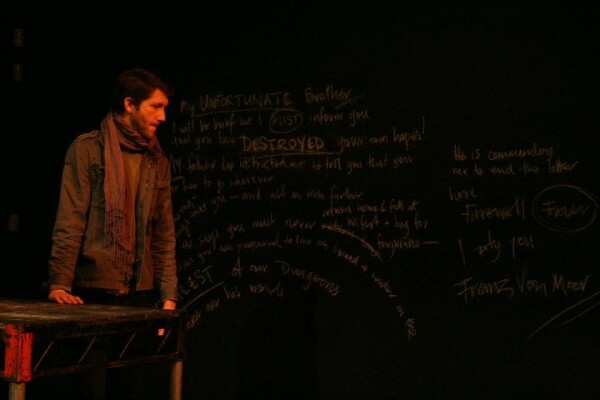 Lies and misdirection dog the steps of many of the piece’s key players, with letters, missives and wanted posters scrawled in chalk across the blank walls and floor building a physical narrative around the characters. As the action becomes more frenzied, we see a wild flurry of tally marks for kills scored, and a sickly Pater Von Moor somewhat poetically covered in the chalk dust of his son’s falsified letter. Disguises and mistaken identities further underline the folly of Karl, Amalia and even Franz in both deifying and vilifying those separated from them; to the point that they are rendered unrecognisable in the flesh. As a device, it feels rather worn, but it serves well enough to make a point. Karl presents the most interesting conflict; torn between his devotion to religion, his family, his lover and his life of freedom with his rebel band. With one hand he will embrace and wear with pride all insults thrown at him, but with the other regret the killing of children and persist in defining himself by his relationship to his father and to those in his command. In a sense, the rebels are the only characters to experience true freedom, as they live wholly in each moment and feel unburdened by any expectation other than their loyalty to each other. It is in this aspect that The Faction’s strength as a company truly shines through; as their ease with each other yields a believably tightly knit band and a wonderfully irreverent rapport, with a bonus and irresistible Breaking Bad reference even making its way in. As a group, they are quite magnetic, with a tangible ability to hold sway over Karl even to the last. Would you like to come to The Boy Who Cried, a brand new play by Matt Osman at The Hope Theatre? Rough Haired Pointer follow The Young Visiters (* * * * * & Editor’s Choice One Stop Arts, * * * * The Public Reviews, * * * * Remote Goat, * * * * What’s Peen Seen) with a strange, beautiful play, in which the mediaeval legend of the werewolf, the modern malady of depression, and a young man’s urge to rebel meet. Press night is on the 7th March, so do let me know if i can arrange a comp. And if you would like any more information do please get in touch. It’s a really brilliant play, one of the most exciting new pieces of writing I have ever read: Matt’s work gives an original and unsentimental insight into depression, but rather than being bleak it takes a stance inflected with humour, dramatic verve and lyricism.